Today we're starting a series on America's Most Unwanted -- or really the NY/NJ/CT region's Most Unwanted -- Landscape Pests. So we've selected Almstead's top 10 unloved insects that plague our landscapes. Some of them are killers (of trees or shrubs), while others just turn a beautiful planting into a shredded mess. The countdown begins with the Birch Leafminer. This is an insect with narrow dietary preferences: Birch trees, particularly Paper Birch, Grey Birch and European White Birch. The Birch Leafminer is a European import; unfortunately its natural predators didn't come across the sea with it. In some areas of the U.S., the European wasps are being released to help keep the Birch Leafminer population under control. 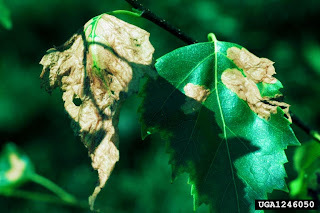 In its adult form, the Birch Leafminer is a sawfly -- but it is the larvae that really wreak havoc on the Birch leaves. These hungry little Leafminers actually insinuate themselves between the top and bottom of leaves where they munch their way along a serpentine path. As these paths intersect, large portions of the leaves start to turn brown. You'll typically notice Leafminer activity in the tops of Birch trees -- since the Leafminer mothers choose the tenderest new leaves as the best place for their larvae to survive. Whole sections can turn brown due to Leafminer activity. Though the brown leaves are unsightly, and won't regrow during the same season, Birch Leafminers are not generally tree killers. However, if an infestation repeats itself over several years, the cumulative damage can be too much for the tree to survive. By the time you are aware of Leafminer activity, it is usually too late to alleviate the damage for the season. As part of an Integrated Pest Management approach, our Almstead arborists recommend early application of controls to prevent the larvae from emerging in the next season.